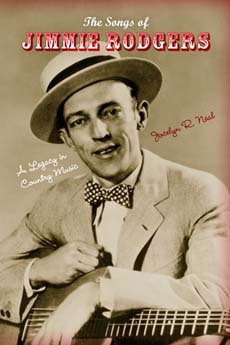 The songs of country music pioneer Jimmie Rodgers have been appropriated by dozens of musicians—such as Dolly Parton, Bob Dylan, and Woody Guthrie—and radically transformed since he first recorded them nearly 90 years ago. His songs have often resurfaced at critical moments when country music has been forced to confront issues of style, gender, race and tradition. In this cultural and historical study, Jocelyn R. Neal traces three of Rodgers' most influential songs—"Muleskinner Blues," "In the Jailhouse Noew," and "T For Texas"—through a century of cover version. Along the way, she constructs a new interpretation of the role of cover songs, the idea of authenticity, and the importance of tradition in country music. Neal offers a progressive new perspective on the role of Rodgers and his music in the making of country music, and on the ways in which individual songs take on special significance in American cultural life. Jocelyn R. Neal is Associate Professor in the Department of Music at the University of North Carolina at Chapel Hill where she teaches music theory, music analysis, and popular music. She lives in Durham, North Carolina.